Frankfurt’s skyline is unique! It is the only city in Germany which has permitted high-rise construction directly in the city center area. As a result, the city on the Main River has been nicknamed “Mainhattan” for its skyline. 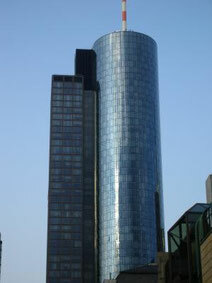 Banks, insurances and well known companies have their headquarter in Frankfurt. 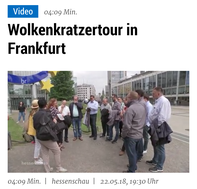 On this tour we pass some skyscrapers and than we visit the Maintower. There is no better way to see Frankurt than from the viewing platform is in 200 m height. * Commerzbank Tower, Japan Tower, Skyper, Silver Tower etc.